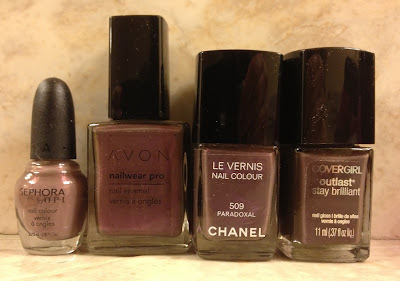 Earlier this month, a reader named Tess left me a comment on a post I did last April comparing Avon's Perplexed Purple to Chanel Paradoxal and Revlon Perplex. ...almost a year later, but I wanted to share that I found another possible Paradoxal drugstore dupe. This time it's in the Chanel-shaped bottles from Covergirl. 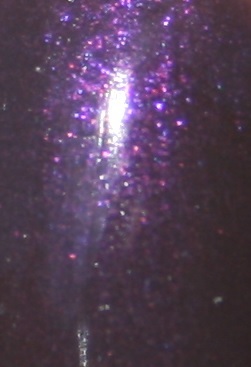 The color is Amethyst and while I can't put my hands on my Paradoxal or Perplex, this looks awfully close. No one's blogged this potential dupe yet but I'm very curious whether you've seen it, since you have the best and most complete comparisons I've seen. So of course I had to go find the CoverGirl! I desperately want to do a post comparing all four on the nails, and also throw in Sephora by OPI Metro Too Chic just because the shimmer is so pretty they make me think of them together. Maybe the sun will be out this weekend and I can get that done. 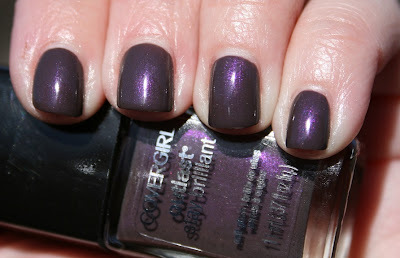 Amethyst was my first purchase from CoverGirl's new Outlast Stay Brilliant line. Although they say the topcoat is built in, I of course ignored that and added a coat of NYC GCS. I got a good five days wear out of this before I started to see chips, and I think two days of indoor swimming pool had something to do with the chips starting. So I'm pretty impressed with this line! Any other shades I should try out?